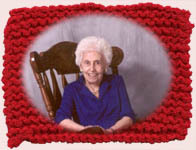 Ethel McCreary, pictured at age 93, had been knitting for over 80 years. She passed away on February 21, 2009, at the age of 101. The Forest Park Women's Club honors her dedication, talent and commitment to the club. The club has raised money for scholarships and other community projects over the years with the sale of these buddies. Ethel’s Kitchen Buddies are a hand-knitted, all-purpose scrubber (cleaning pad) that can be used on almost any surface and with any type of cleaning agent (detergent, bleach, etc.). Use them on dishes, pots, pans, and any surface that may need to be scrubbed (i.e. plastic linings of swimming pools, kitchen or bathroom tiles, shower doors, etc.). People are constantly discovering new uses for Ethel’s Kitchen Buddies! One customer found they’re great for removing lint and pet hair from clothing. Ethel’s Kitchen Buddies will never rust or wear out because they are made of a special blend of nylon material. They can be easily cleaned and sanitized by soaking them in a mild solution of bleach or by washing them in the dishwasher. Some customers have reported that they have been using the same Kitchen Buddy for as long as seven years! It is said that the only way you can get rid of one is to lose it! The Kitchen Buddies are $5 for 2 small buddies — and the proceeds help support our scholarship program. Please contact the Forest Park Women’s Club to order your Ethel’s Kitchen Buddies today — they will also be available for sale at our annual Craft Show and Bazaar. They make wonderful gifts to share with your family and friends.